The rotunda at the historic Steinway Hall in Manhattan. The building will be torn down to build luxury condominiums. New York is saying goodbye to another historic building. 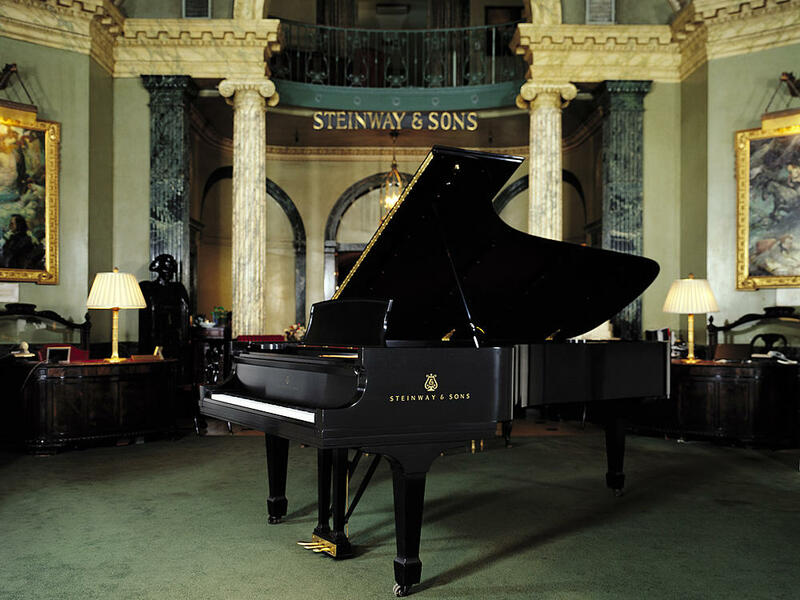 Steinway Hall, the main showroom for Steinway & Sons pianos, will be moving to a new location, leaving its home of almost 90 years on 57th Street near Carnegie Hall. The first floor has been designated a landmark and will be preserved, while the rest of the building will be torn down to build high-rise luxury condominiums. Steinway Hall was, quite literally, the shop window for Steinway pianos in New York City. When it was built in 1925, the architects — who also designed Grand Central Terminal — created a large curved window to allow pedestrians to look inside, according to Ron Losby, president of Steinway & Sons for the Americas. "And that was quite high-tech at the time," Losby says, "because when anybody was walking down 57th Street, when they looked in the window, there was never any glare and they could see every piano as beautifully as if they were standing right in front of it." When potential customers walked inside, they were greeted by a grand Beaux Arts rotunda with a crystal chandelier, imported Italian marble, frescoes on the ceiling and painted portraits on the wall. Portraits and busts are everywhere, including Anton Rubinstein, Franz Liszt and, more recently, "Mr. Billy Joel." But the real action is downstairs. "Behind this very unassuming metal door that could be the entrance to any type of a room, that is what is known as The Basement," Losby explains. "This is where Rachmaninov met Horowitz for the very first time. This is where all the artists come to select their instruments." As Losby speaks, there's music wafting from behind the famous door. "You can hear, right now," he exclaims, "Hélène Grimaud is selecting a piano for her performance in New York!" Actually, she was selecting a piano for a new recording. Steinway not only sells pianos but loans them to major performers, like classical pianist Grimaud. "I'm so fond of this space. I always love coming in to it," Grimaud says. "You know, my heart starts to beat faster as I approach the door. I just love walking in here. There is something, it is just — I don't know what it is imbued with, but there is something which resonates." Pop star Regina Spektor remembers coming to Steinway Hall shortly after she got a contract with Warner Brothers and needed to find the right piano to use on her first recording. She came to the U.S. from the former Soviet Union when she was 9, and says she was overwhelmed by the selection in The Basement. "And it was really, really hard," Spektor says, "because each one was better than the other, and they were all giant. And actually the space that we had was small, so we ended up going with this little guy that, I think by the middle of the record, I was just, If I could go back in time, and I could've had more money, I would've bought that guy. It was such a great piano!" Steinway artist Christopher O'Riley, host of NPR's From the Top, found a bigger guy to take to his California home — a 9-foot concert grand. He recently came to Steinway Hall just to practice in The Basement. He says he'll miss the space, but still thinks Steinway is making the best pianos they have in years. "It just makes you want to cry, you know, that here is this venerable old company that's gone through all kinds of changes and now going through, probably, the biggest change," O'Riley says. "Going from this beautiful, venerable old room and building and basement to new digs. But, yeah, they're at the top of their game." The new Steinway Hall will open in about a year, a dozen blocks south. It will be a state-of-the-art facility, with a concert hall and recording studio — and an entirely new Basement. New York City is saying goodbye to another historic building - Steinway Hall, the main showroom for Steinway and Sons pianos, will be moving to a new location from its home of almost 90 years near Carnegie Hall. The first floor has been designated a landmark and will be saved while the rest of the building will be torn down to build - wait for it here - luxury high-rise condominiums. Jeff Lunden reports. JEFF LUNDEN, BYLINE: Steinway Hall was, quite literally, the shop window for Steinway pianos in New York City. When it was built in 1925, the architects - who also designed Grand Central Terminal- created a large curved window to allow pedestrians to look inside, says Ron Losby, the president of Steinway and Sons for the Americas. RON LOSBY: What that did is, when anybody was walking down 57th Street, when they looked in the window, there was never any glare and they could see every piano as beautifully as if they were standing right in front of it. LUNDEN: When potential customers walked inside, they were greeted by a grand Beaux Arts rotunda with a crystal chandelier, imported Italian marble, frescoes on the ceiling and painted portraits on the walls. LOSBY: Around here is the Steinway art collection. And we can see that we have Anton Rubinstein, Franz Liszt and, of course, more recently, we have Mr. Billy Joel. BILLY JOEL: (Singing) Sing us a song, you're the piano man. LUNDEN: But the real action is downstairs. LOSBY: Behind this metal door, this very unassuming metal door, this is what is known as the basement. This is where Rachmaninov met Horowitz for the very first time. This is where the artists come to select their instruments and you can hear right now Helene Grimaud is selecting a piano for a performance in New York. LUNDEN: Actually, she was selecting a piano for a new recording. Steinway not only sells pianos, but loans them to major performers, like classical pianist Helene Grimaud. HELENE GRIMAUD: I'm so fond of this place. I always love coming into it. You know, my heart starts to beat faster as I approach the door. I just love walking in here. There is something, it's just - I don't know what it is imbued with, but there is something which resonates. LUNDEN: Pop star Regina Spektor remembers coming to Steinway Hall shortly after she got a contract with Warner Bros. and needed to find the right piano to use on her first recording. She came to the U.S. from the former Soviet Union when she was 9 and says she was overwhelmed by the selection in the basement. REGINA SPEKTOR: Each one was better than the other and they were all giant. And, actually, the space that we had was small, so we ended up going up with this little guy that, I think, by the middle of the record, I was just - if I could go back in time and I could've had more money, I would've bought that guy. It was such a great piano. SPEKTOR: (Singing) I must go on standing. You can't break that which isn't yours. LUNDEN: Steinway artist Christopher O'Riley found a bigger guy to take to his California home - a nine-foot concert grand. He recently came to Steinway Hall just to practice in the basement. He says he'll miss the space, but still thinks Steinway's making the best pianos it has in years. CHRISTOPHER O'RILEY: It just makes you want to cry. You know, that here is this venerable old company that's gone through all kinds of changes and now going through, probably, the biggest change, you know, going from this beautiful, venerable old room and building and basement to new digs. But yeah, they're at the top of their game. LUNDEN: The new Steinway Hall will open in about a year, a dozen blocks south. It will be a state-of-the-art facility, with a concert hall, recording studio and an entirely new basement. For NPR News, I'm Jeff Lunden in New York. (SOUNDBITE OF PIANO) Transcript provided by NPR, Copyright NPR.